Tuesday’s televised meeting in the White House between US President Donald Trump and congressional Democrats went off the rails, naturally, but in the middle of the battle royale, Vice President Mike Pence sat like a rock. Twitter, naturally, noticed this and had a field day. Perhaps the free-for-all Tuesday between Trump and Congress' two leading Democrats — presumptive House Speaker Nancy Pelosi and Senate Minority Leader Chuck Schumer — could have been predicted. The lawmakers had gone to the Oval Office to discuss Trump's threatened government shutdown over the legislature's failure to fund the proposed border wall with Mexico, the president's pet project since the 2016 campaign trail. "If we don't get what we want, one way or the other, whether it's through you, through military, through anything you want to call, I will shut down the government," Trump said Tuesday. "I will take the mantle. I will be the one to shut it down." "This Trump shutdown, this temper tantrum that he seems to throw, will not get him his wall and will hurt a lot of people," Schumer fired back. "This has spiraled downwards," Pelosi lamented. However, whether Pence knew a fight was brewing or not, when the cats started hissing and scratching, he kept out of it. Pence's stoic expression and seeming aloofness didn't go unnoticed by Twitter, which had lots of fun at his expense — and a bit of empathy for being a fly on the wall in such a cringe-worthy spat on national TV. 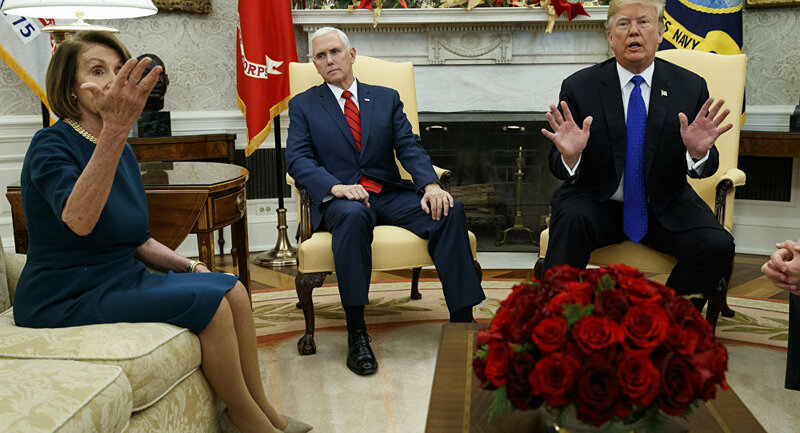 ​Folks noticed that Pence sat so still he hardly seemed real, compared to the animated Schumer, Pelosi and Trump. I think it's a cardboard cut-out. The real Pence is out with the pool boy. ​Others attributed his reserved demeanor to his noted "good boy" personality, for which the internet has ripped him before. ​Some took a more neutral position, noting Pence was clearly trying not to get sucked into the conflagration around him. And good ol "Tight Lips Pence"
​Some thought maybe the Veep was concealing an inner anger at his boss, whose job seems to be constantly threatened by congressional Democrats. ​Looks like Congress will have to sort out its differences with the president by December 21 without Pence's help. If they can't by then, the government will run out of money, and the majority of its operations will temporarily shut down until a new spending bill authorizing funding can be cobbled together.